Near the end of the Costa Mesa Charter Committee meeting last night in the Emergency Operations Center (EOC), attorney Yolanda Summerhill told the committee and facilitators Dr. Kirk Bauermeister and Dr. Mike Decker that Senate Bill 311 was signed by Governor Jerry Brown, which means that, in general terms, most ballot measures involving charters may ONLY be placed on a General Election ballot. She affirmed that, if this committee does, in fact, move forward with a recommendation for a charter to the City Council, they have a little more time on their hands now. The earliest a charter proposal could be placed before the voters would be November, 2014, during the General Election. Mayor Jim Righeimer wanted their work-product to be on the Primary ballot in June of next year. This, of course, is good news for the residents of Costa Mesa, since the committee now has more time to craft a proper charter and no longer have to worry about being mired in minutia. They now have several months more to do the work. I'm not sure all the members will view this as a good idea. A few residents and other visitors spoke to the committee, outlining their thoughts about the charter process. The "Prevailing Wage" issue is one that will soon be discussed at length, so representatives from labor and employer groups expressed their views on that subject. This meeting of the committee seemed to run fairly smoothly - a fact acknowledged by several members as they addressed the agendized item about whether to name a Chairman and Vice Chairman. The group seems to be satisfied with the facilitation model that's being followed now. 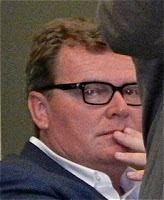 Tea Party Tom Pollitt opined that having a Chairman would be good because, once the committee completed its assignment, the media would have someone to ask questions of. In case you're wondering, that wasn't the strangest thing he said last night. So, the committee will continue with the facilitation of Bauermeister and Decker. A good decision. Early in the meeting the committee made two decisions that created the beginning bones in the skeleton of what may be a charter for the city. 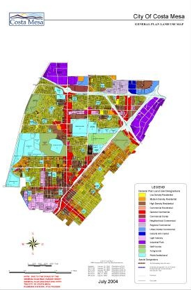 They agreed to call the city "Costa Mesa" and agreed that the current boundaries be codified. If this sounds like something that probably should have been done within the first five minutes of the first meeting, you may be right. But, then, you probably have not been following the proceedings very closely. NOTHING happens quickly, especially when significant chunks of time were wasted at at least two meetings trying to resolve the whole "Invocation" issue posed by Tea Party Tom. Yeah, I know.. as I said before, NOTHING happens quickly. Once again, the professionalism and presence of Director of Public Services, Ernesto Munoz, was the high point of the meeting. As requested by the committee at the previous meeting, he prepared a memo outlining the current Labor Compliance Procedures, including an extensive list - fourteen (14) items - that outlined steps the staff took during the processing of contracts for the City. Several members expressed admiration that the staff followed such a comprehensive plan as part of their work assignments. More than once we heard members exclaim, "I didn't know about that!". Of course, why would they, or any member of the public? The memo just captured how the staff goes about doing its job without fanfare, but with a very high level of professionalism. The committee continues to move slowly through the process they originally prescribed, occasionally getting sidetracked by peripheral dialogue by their members. That practice needs to be tightened-up or this process will still be dragging along next summer. One of the problems seems to be the inability of some members to stay focused on the issue at hand. One member, for example, just had to bring up the unfunded pension liability, which was superfluous to the discussion at the time. Much discussion was held on whether certain phrases should actually be part of the charter, or just part of the preamble. Tea Party Tom, for example, seemed firm that he wanted a phrase he created to be a major part of the charter. It was so broad that it basically said the City Council could do anything it wanted. Wiser folks prevailed and the phrase was sent to the legal folks for an opinion. There were a few amusing moments last night. 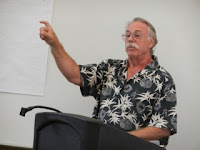 For example, during the discussions member Harold Weitzberg frequently expressed the opinion that the committee should be wary of changing something that's not broken. At one point Ron Amburgey said, "I hate to admit it, but I agree with Harold." There was a whole lot of smiling after that one. The committee seems to have settled in with a pretty darn collegial approach to discussing important issues. There was generally respect for each others views and cordial discussion. However, Brett Eckles suggested that time on the agenda be carved out for each member to just "talk" - to say what may be a specific concern for them. There was agreement from the group, with others chiming in, indicating they felt just a little stifled by the format. 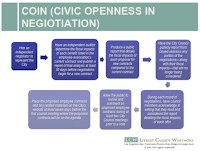 One of the frustrating moments for me was the stubborn insistence of member Gene Hutchins that the COIN policy be utilized for ALL contracts. 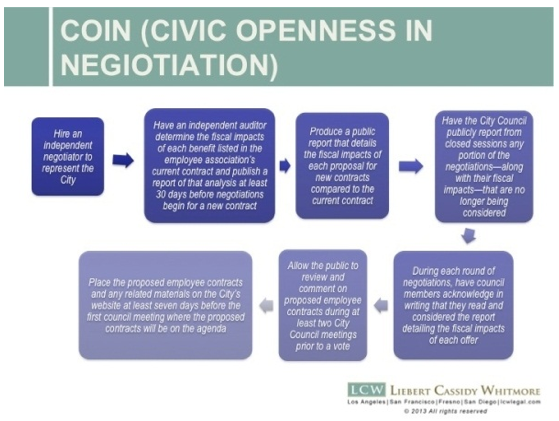 You may recall that COIN was hatched by Mayor Pro Tem Steve Mensinger to, theoretically, provide more transparency to the labor contract negotiations. It is specifically NOT designed for public service contracts, but Hutchins just wouldn't let it go. He kept saying that COIN was working just fine when, in fact, we don't have any idea if it will work at all. He sounded like he was just parroting things Mensinger says all the time with no facts to back him up. In the end, the issue was passed to the legal time for an opinion. There's a whole lot of that going on. By the time the meeting finally wrapped up, nearly three and half hours later, Munoz had an assignment to provide information at the next meeting about how costs might have differed on recent contracts IF prevailing wages had NOT been used. This is another big assignment for him, but he seemed willing to provide the committee the information. And, Summerhill took away with her several items to research before the next meeting. Speaking which, the committee will next meet in the EOC on September 11, 2013 beginning at 6:00 p.m.
Today is the 50th anniversary of Dr. Martin Luther King's "I have a dream" speech, delivered on the steps of the Lincoln Memorial in Washington, D.C. before an estimated quarter million people. According to most observers, this was the seminal moment of the modern civil rights movement in this country. Because I lived through, and much too near, some of the events that marked that time in this country's history, I'd like to share some of that history with you. Bear with me... it's a long story. When Dr. King gave that speech I was a 22-year-old southern California kid who had just dropped out of college for the second time to earn money so I could continue later. I was a fairly typical middle class white kid, who did middle class white kid stuff. I had girlfriends, did water-oriented sports - spent time at the beach, swimming, water polo and water skiing - and had gone to schools which had not a single black person in them. In fact, it wasn't until I went in the Army that I actually met a black person. It wasn't something I worried about - I just never gave it a thought. Dr. King's speech was near the end of the summer of 1963 and I remember being vaguely aware of it. I was busy working, dating, water skiing and having a good old time. Then I got my draft notice. It was the beginning of the ramp-up of the Viet Nam War and my lottery number came up. I recall taking my draft physical exam, but not being particularly worried about joining the Army. The thought never crossed my mind to somehow evade the draft. It was a duty I felt obligated to fulfill. Then John F. Kennedy was killed just three weeks before I was scheduled to be inducted. I still recall that day like it was yesterday. I was measuring homes for carpet and was on my way to Santa Monica for my next assignment and couldn't find any music on my car radio. The wind was blowing over my buzz-cut head - as a swimmer, I hadn't had hair longer than about an eighth of an inch for a couple years - as I drove my '57 Chevy convertible to the next job with the top down. It was a perfect southern California day. Finally, I just quit pushing buttons on my old AM radio and listened to the news and heard of Kennedy's assassination. Not quite sure what I should be doing, I continued to the home, rang the bell and an elderly gentleman answered with tears in his eyes. On the black and white television I could see news reports of the event. I offered to reschedule, but he and his wife invited me in and I spent the next half hour crawling around their home, measuring the rooms, listening to the news in the background and hearing both of them sobbing quietly. I'll never forget that day. The middle of December I was inducted into the Army and I finally had my first up-close-and personal experiences with black men, although it didn't really register that they were black - we were all in the same boat, dealing with the stress that was basic training at Fort Ord. I do recall our drill instructor - a very fit black sergeant who relished chiding us as he did one-armed push-ups. The objective was to break us down physically and mentally, then rebuild us to become soldiers. They generally succeeded. After basic training I was sent, along with three classmates, to New York City, where my typing speed on a frigid, damp winter morning at Fort Ord had qualified me to be a clerk at the Army Pictorial Center - formerly the Paramount Studios - in Queens. It was an unusual post. The main facility was the studio and our barracks building was just across the street. For the next several months I was a soldier in New York City, trying to deal with life in the big city on $99.00 a month, gross. It was an experience unlike anything before in my life - and it was then that I made my very first black friend. Hayes Manning and I were two of four guys who shared a "bay" - a cranny with two sets of bunk beds and a chair and table in that large barracks building. We didn't choose each other - we were thrown together - but we developed a friendship in our few months together that lasted the rest of his lifetime - he died a couple years ago. Hayes was an educated man from San Francisco - a bit of a snob with a very interesting life. His father went to Harvard and his mother attended Radcliffe. His aunt Joyce was married to jazz promoter George Wein- the man behind the Newport Jazz Festival, who has been described as "the most important non-player in jazz history." I only mention this because Hayes and I would occasionally take the subway to Aunt Joyce's house on Central Park West and just hang out - an island of respite from our military lives. In almost every case jazz musicians of world renown would also be there, hanging out and playing their music. It was a surreal time for me, with Uncle George and I the only white men in the building most of the time. Folks like Thelonius Monk, Charlie Parker, Dizzy Gillespie and John Coltrane, for example, were regulars. These were the black people in my life at that time. Several months later I applied and was accepted to the Warrant Officer Flight school to learn to fly helicopters. The Viet Nam War was escalating and the Army needed pilots - bus drivers to shuttle soldiers around the battlefields. I didn't want to waste my time in the Army sitting on my fanny, typing orders all day - that seems very ironic now, considering how I spend most of my days. So, in October of 1964 off I went to the primary flight school just outside Fort Worth, Texas. In the meantime, deep in the south, three young civil rights workers were kidnapped and killed just outside Philadelphia, Mississippi. You'll understand why I mention this shortly. I went to rotary wing flight school and excelled. I was the second man in my class of 142 to pass my solo check ride after 5 hours of instruction. I would have been the first, but I blew my first check ride. That's another story. Unfortunately, after three months of flying, an eye problem grounded me just as my class was moving on the the Advanced School at Fort Rucker, Alabama - deep, deep in the armpit of the south. I transferred with my class, but never flew a helicopter again. On the way from the primary school I drove myself and my best friend in flight school across Texas, Louisiana, Mississippi and on into Alabama. We crossed Mississippi a few miles from Philadelphia at a time when racial tension was extreme. In fact, as we drove through Montgomery, Alabama before turning south to Fort Rucker - which was near the Alabama, Florida, Georgia borders - we crossed the Pettus Bridge, the day before the first so-called Freedom March. Having been sequestered in flight school for a few months, we didn't know a thing about it, although we did see a couple hundred state trooper cars at the barracks on the north side of the bridge. At the time, although I didn't know it, my friend had a loaded .357 Magnum pistol under his seat in the car. If we, two white guys in a car with California plates, had been stopped and that gun found we'd have been lucky to go to jail. I recall thinking at the time that you could cut the tension with a knife - it was very much like pre-lynch scenes in "B" movies of the 1940's. It was a strange time. So, off we went to Fort Rucker where my friend and my other classmates finished their training and graduated in July - 87 of the 142 made it. Of those men, 80 went to the First Cavalry Division (Air mobile) at Fort Benning, Georgia, five went directly to Viet Nam and two went to Korea, then were assigned on temporary duty to Viet Nam. The entire First Cav. Division went en masse to Viet Nam in September, so my entire class was there within a few months of graduation. Six of them didn't make it through their first tour. I, on the other hand, remained at Fort Rucker while the Army tested me for the eye problem. They never figured it out, so I served the remainder of my enlistment there in the bowels of bigotry. This was a part of the country that really hadn't yet joined the 20th Century. In those days folks in Alabama worshiped University of Alabama football coach Bear Bryant, Governor George Wallace and God, in that order. In Dothan - the closest town of any size to the post - blacks still had separate restrooms and drinking fountains and were required to buy tickets to the movies on the opposite side of the ticket window and were forced to sit in the balcony. Three weeks before I left active duty a cross was burned on the lawn of a black sergeant ON POST! During the 1960's the KKK still dominated much of the social and political life in the American South. Children were being murdered as black churches were burned with them inside. Black men were lynched with regularity. Some of you will remember that the summer of 1965 was the time of the Watts Riots. I recall sitting in the day room in our company area watching television before the riots - blacks and whites co-mingled and having a good old time. However, when the riots began everything changed. Blacks would sit on one side of the day room and cheer as the television showed black looters dragging televisions and other stuff out of stores. The whites sat on the other side of the day room and cheered when the National Guard opened fire. It was never the same again. I got out of the Army near the end of 1965, just as Viet Nam was boiling over, got a job, got married, and with my lovely and patient wife, moved around the country for my employer for several years before settling here in Costa Mesa 40 years ago. We lived in Houston in the late 1960s when it was the murder capitol of the country - mostly blacks killing blacks - and many of our native Texan friends still uttered the "N-Word" in casual conversation. During those years, as we moved around the country and later, Bobby Kennedy and Martin Luther King were assassinated, Ronald Reagan was shot, Richard Nixon resigned in disgrace, Bill Clinton set a new low bar for personal behavior in office, a father and son named Bush served as President, we managed to embroil ourselves in yet another unpopular war in a far away place and this country elected a black man as President - twice. And yet, a half-century later, Dr. King's dream remains unfulfilled. Black unemployment is double - in some areas triple - the average and many of our black-dominated cities are in deep trouble. Detroit is the best/worst example of that. Most large metropolitan schools are fully integrated - and many are failing. Prisons are filled to overflowing, and the biggest demographic in those prisons is black young men. According to recent statistics, non-Hispanic blacks - which represent just under 14% of the population - account for more than 39% of the prison population. 1 in 11 black men are in prison! Let that sink in a little. Over 9% of black men in this country are in prison! By every measure of success blacks lag significantly behind whites in this country - education, economic prosperity - you name it. I sit here, in a community where the black population is tiny and even smaller in the community with which we share a common border to the south. We are in an area where we just don't have much to do with black Americans, so we don't think about them very much. So, today, on this anniversary - a date that most black Americans will celebrate and many white Americans will not - I wonder why more progress has not been made in the half-century since Dr. King uttered those words, "I have a dream that my four little children will one day live in a nation where they will not be judged by the color of their skin but by the content of their character." I lived in the South in the 1960's. I know from first hand experience what Dr. King was talking about. I don't want to see anything resembling that terrible time to occur in this country again. Take a couple minutes and read the full text of Dr. King's speech, HERE. If you wish to view it, you can do so by clicking HERE. Whether you celebrate this day or not - whether you admired the man, or not - the message Dr. Martin Luther King delivered fifty years ago today should be remembered by all of us, for the message of hope it delivered and for the reminder that we still have a long, long way to go on that path. To comment on this blog you must FIRST register. Click HERE for details. This afternoon, in a crowded conference room on the second floor of City Hall, members of the Planning staff and the public had a chance to hear from representatives from the Orange County Chapter of the Building Industry Association of Southern California for a second time on their views/preferences as the City of Costa Mesa moves forward with the General Plan Update. It's not clear to me why they got two shots at this, but the meeting was fruitful. They had yet another chance to hear residents voice their opinions, much to their probable chagrin. This was the second time we've had a chance to hear from these same folks - I covered the first meeting last May, HERE. The same players from the BIA attended this meeting - Chief Executive Officer Michael Balsamo and Victor Cao, their head of governmental affairs as well as a couple of local developers. Three staff members - Gary Armstrong, Director of Economic and Development Services, Claire Flynn, Assistant Development Services Director and Minoo Ashabi, Principal Planner attended. I was among more than a dozen residents who attended this meeting, most of whom have attended the other meetings dealing with the General Plan and who have been frequent speakers on the issue. Maintain and enhance existing Overlay Zones and Specific Plan. Consider use of a Specific Plan or Overlay Zone for the Harbor/Newport Blvd Corridors that promotes a moderate increase in density up to 50-60 dwelling units per acre at appropriate locations. Streamline entitlement process through use of by-right development and staff level administrative review. Provide assistance in parcel consolidation when possible. Reduce parking requirements in order to promote smart growth and alternate modes of transportation. Realign open space requirements and park in-lieu fees using most recent market and demographic data and in accordance with State Law. As you might expect, members of the public were curious about some of those ideas, particulary the density numbers and the parking issue. As it stands right now, south of the 405 Freeway density of no greater than 20 dwelling units per acre is permitted and this city has an on-going and pervasive parking problem throughout. 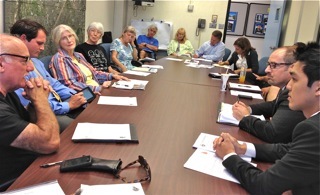 Many of the residents spoke to the issues outlined above, and several others, too. Among them were the current imbalance between rental units and owner-occupied housing. The city is upside down, with a 60/40 ratio of renters to owners. 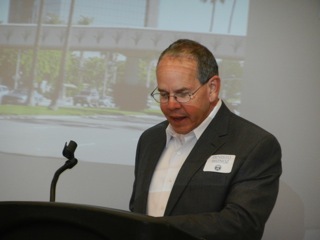 Former councilman Jay Humphrey, who attends many of these meetings, reminded the BIA folks that Costa Mesa is the 36th most densely-populated city in the country - not county or state, but in the entire nation. It's hard to imagine increasing housing density in any areas of the city with that bit of knowledge banging around in our heads. WESTSIDERS - "STOP PICKING ON US!" When the BIA folks suggested that not every area should be targeted for increased density, members in attendance from the Westside reacted as you might expect - with no small degree of rancor. Their view is that the Westside is just fine, thank you very much, so quit picking on us to "fix". 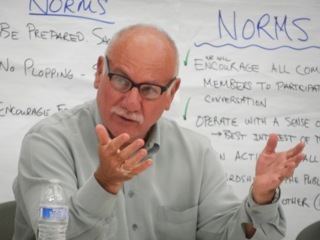 The conversation frequently turned to the issue of "problem motels" - something Mayor Jim Righeimer and Planning Commission Chairman Jim Fitzpatrick have chosen as their cause of the moment. If you've read this blog for awhile, you know this issue has been simmering for several years. I agree that something needs to be done to clean up several of the motels that have become havens for drug use and prostitution, plus are "affordable housing" for many down-and-out families. 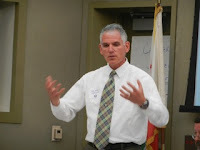 It was during one of these discussions near the end of the 80 minutes we were together that I told the BIA folks of the mayor's recent and frequent exposition of his plans to put pressure on motel owners to either change their ways or sell out. Currently, many of those units are cash cows - Righeimer's favorite term - bringing in mountains of cash for the owners who are not disposed to either maintain them nor follow established rules. Righeimer's plan, as mentioned many times in public forums recently, is to adopt some new ordinances - a "Nuisance Ordinance" and an "Excess Use of Resources Ordinance" to squeeze the owners into compliance. His thought, as he described it many times, is to change the owner's perception of the value of their properties by imposing fines and other sanctions - fees for public safety calls, for example - to de facto force the value downward. That might make it possible for developers to acquire those parcels at a rate that would pencil out if converted to - you guessed it - high density housing! As Righeimer has so eloquently put it - "We have to be willing to trade drugs and prostitution for higher density." I didn't, and still don't, think those are, nor should be, our only options. And, I'm sure not eager for the mayor to get us embroiled in more legal action with that kind of approach. He has acknowledged that his plan "might lead to more litigation", and it doesn't seem to bother him at all. He's a one-man retirement plan for local law firms, for goodness sake! "WE DIDN'T ASK FOR THAT!" According to the City web site, HERE, the next General Plan meeting is Land Use Part 2, 6:00 - 8:00 p.m.at the Neighborhood Community Center, 1845 Park Avenue (Lions Park) on Thursday, September 12, 2013. The next one, a Circulation Element Workshop, is from 6 - 7:30 p.m. on Wednesday, September 18, 2013, at the Emergency Operations Center (EOC) at 99 Fair Drive, next to Police Headquarters. More on each of those as the dates approach. Remember that you MUST register before you post a comment. Those submitted by un-registered folks will be deleted without being read. Click HERE for the information about registration. The Costa Mesa Planning Commission meeting Monday night lasted only 90 minutes, but it could have been much shorter. 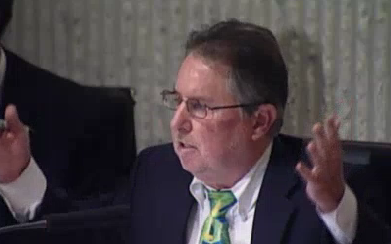 The agenda was thin, but Chairman Jim Fitzpatrick apparently felt the need to hear himself talk, so he yammered on and on about motels - his pet project. When he was finished he congratulated himself by stating "Excellent!" Geez! His mirror must be his best friend. One of the things he told the half-dozen of us in the audience was that on September 4th the Planning Commission is taking a little road trip. Seems they're going on an "affordable housing tour", but they're going to Irvine for the tour! Guess we don't have any such housing in the city. Commissioner Jeff Mathews told us that there are many pending new ordinances in the works. He listed one for Excessive Use Of Services Ordinance, Nuisance Ordinance, a Shopping Cart Ordinance, a Hooka Lounge Ordinance, and a Group Home Ordinance. Public Hearing #1, the request from developer Al Mozayeni for a one-year extension on his proposed project on Anaheim street - to be piled on top of the three previous such requests. Commissioner Colin McCarthy was ready for him, though. He might just as well have stepped down from the dais and slapped him around a little, because that's kind of how it looked from the cheap seats. Even after a compromise motion to extend his opportunity to develop his project for only 6 months was made, McCarthy was merciless, flat-out stating that we'd never see that project completed. I must say that I understand his anger, but NO commissioner or councilman should EVER berate an applicant standing before them. His behavior last night is only one symptom of the character deficiencies so many of the council sycophants demonstrate every day. Finally, after nearly an hour of discussion, the commission voted 3-1 - McCarthy voting no - to extend his opportunity for six months. The second Public Hearing, Peter Zehnder's project on Santa Ana Avenue, was continued to the meeting on September 9th. Zehnder, who was outside the auditorium before the meeting, did not attend this one. The commission agreed with an unidentified resident that the freshening of the Smart & Final store on West 19th Street should receive the nomination as the recipient of the Planning Commission Design Award. Seems like we have a low threshold for that award. The final item on the agenda found Code Enforcement Officer Fidel Gamboa, who described recent changes in the way Code Enforcement approaches violators. New violators - folks with a first time offence - are just given a slap on the wrist and asked to fix the problem. Should they fail to do so a citation may be issued. Repeat offenders are treated more severely. Gamboa described a significant level of discretion that the officers exercise. I need to know more about this, because if we have rules they should apply to everyone, right? I'll report back later. So, one down, two to go. The next meeting I plan to attend is the meeting of the Building Industry Association meeting tomorrow with city staff to provide input on the General Plan. It will be held in Conference Room 2 at City Hall at 2:00 p.m. I'll report on that one tomorrow. The Costa Mesa Planning Commission, chaired by the ever-dynamic Jim Fitzpatrick, will meet again this evening at 6:00 in City Council Chambers for what may be a fairly short meeting. On the agenda tonight, HERE, are a couple of public hearings and two items under new business. The first Public Hearing is a request for a FOURTH one year extension of a project that proposes building 26 attached three-story units with a handful of deviations, listed on the staff report, HERE. The staff recommends approval of the request. generated significant public outcry when it was first presented on July 8, 2013. You'll understand why when you read the list of variances, administrative adjustments, deviations and minor modifications involved. Under New Business there's a request from a resident to nominate the renovation of the Smart & Final store on east 19th Street for an award. The final item on the agenda, HERE, is a presentation by staff on how Code Enforcement violations are handled. This should be interesting, since there's a lot of "urban myth" stories about Code Enforcement policies floating around these days. WHY TWO MEETINGS A MONTH? So, once again, the Planning Commission has very little to do at this meeting - which seems to be a habit ever since they decided to meet twice a month again earlier this year. I'm still trying to figure out how this makes any sense from a "utilization of staff resources" standpoint. I'll report later this evening on the events of this very brief meeting. Remember, NO comments will be posted unless the author has previously registered. Get the details HERE. The last couple weeks will be memorable in the annals of Costa Mesa lore. Things happened that have most likely never, ever happened before throughout the entirety of Costa Mesa's history. For example, after a rousing success with the 60th Anniversary Celebration the end of June, it looks like there's trouble in River City. Two employees - those responsible for coordinating the event and guiding the activities of the committee appointed to plan the event - were placed on administrative leave and, a few days later, boxes of "stuff" were observed being moved from the 5th floor of City Hall to the Police Department, a few yards away. Nobody is 'fessing up to moving the stuff, but logic tells us that it was likely one law enforcement entity or another. We do know that Public Records Requests for information dealing with the financials of the 60th celebration have been responded to very slowly, in part, apparently, because much of the information requested is buried in the bowels of that "stuff". 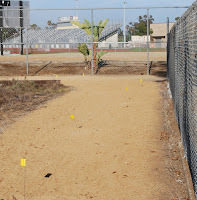 And then we have the Great Trail Mystery - the decomposed granite pathway that was installed on the sly, running along the Fairview Park side of the fence between the park and Waldorf School. There are reports of men being seen installing the path - which encroached significantly on at least one federally-protected vernal pool. 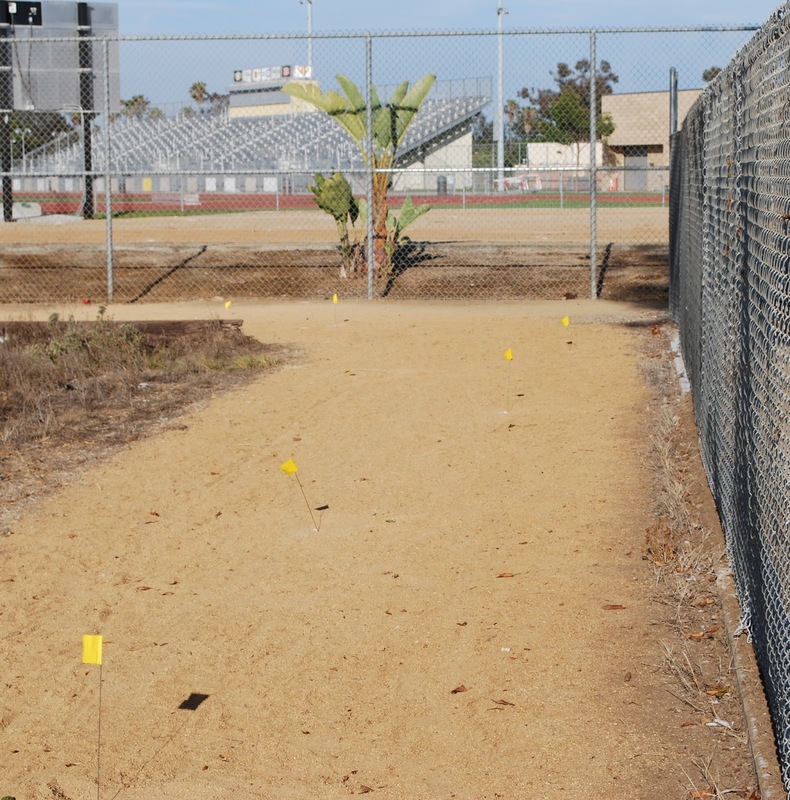 Although he denied knowing anything about the path, when he was shown photographs of it marked with flags showing the delineation of the boundaries of the pool, Mayor Pro Tem Steve Mensinger shifted into a different mode, apparently exclaiming something to the effect, "Well, what do you expect the kids going to school to do - walk through weeds?" So, one presumes that Mensinger had prior knowledge of the path, and that it was "all about the kids" - his mantra for almost every breath he takes. It has been reported that folks have photos of the trail being installed, and that there may be a familiar face or two in them. We'll see. One thing is sure... now that the federal government is involved - yep, they know about this transgression and apparently are NOT happy about it - extraordinary measures will be taken to discover who installed the path, and who authorized it. It's my understanding that penalties could range from a simple slap on the wrist and the requirement to rehabilitate the destroyed pool to much more severe penalties imposed on the city for it's failure to be the good steward of those pools as agreed upon many years ago. And then we have THE BIG EVENT - the lawsuit filed by Mayor Jim Righeimer, his wife Lene, and Mayor Pro Tem Steve Mensinger against the Costa Mesa Police Association - the rank and file officers charged with keeping us safe every day. The suit also involves Private Investigator Chris Lanzillo, the law firm of Lackie, Dammier, McGill & Ethir for which he had worked and 25 John Does - unnamed folks they may wish to fold into the lawsuit later. 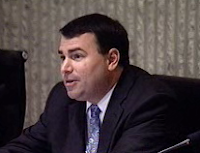 The forty-three (43) page document includes fourteen (14) causes of action in which Righeimer, his wife and Mensinger claim significant damages arising out of the much-publicized event last year when Lanzillo followed Righiemer out of councilman Gary Monahan's bar, called the police to report him driving erratically, followed him home and observed our most highly decorated DUI enforcement officer, Kha Bao, speak with Righeimer and resolve that the mayor had not been driving under the influence. Then, it is alleged, that Lanzillo tried to run Mrs. Righeimer down when she approached his car. Personally, I have a hard time with that last part, since the CMPD officer was still there and certainly would have seen such an act and arrested Lanzillo on the spot for assault with a deadly weapon. I've gone through the entire "Complaint for Damages" several times and it doesn't take long to find mistakes in the document, including inaccurately describing the mayor's election dates and ignoring the fact that Mensinger was elected to his position. And, adding a little amusement to the document, in Paragraph 71 the text states: "Defendants' conduct, directed towards Plaintiffs, as described herein, especially with respect to the INCIDENT, was outrageous and extreme and beyond the bounds of conduct tolerated by civilized society. It was carried out intentionally, or wonton disregard of the probability of causing Plaintiffs to suffer emotional distress." I guess it's pretty serious when Chinese dumplings are involved, huh? I guess it's too much to ask your high-powered lawyer to run a spell check program, huh? 81. Defendants' above-noted actions were the legal and proximate causes of physical, psychological, emotional, and economic damages, and damage to their reputation Plaintiffs have suffered and continue to suffer to this day. These actions of Defendants have also resulted in Plaintiffs incurring, and will require them to incur into the future, expenses for medical and psychological treatment, therapy, and counseling. 82. 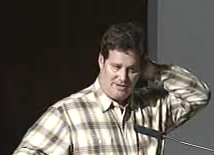 As a result of the above-described conduct, Plaintiffs suffered and continue to suffer great pain of mind and body, shock, emotional distress, physical manifestations of emotional distress, embarrassment, loss of self-esteem, disgrace, humiliation, and loss of enjoyment of life; have suffered and continue to suffer and were prevented and will continue to be prevented from performing daily activities and obtaining the full enjoyment of life; have and will continue to sustain loss of earning capacity; have and will continue to suffer damage to their business reputation; and have incurred and will continue to incur expenses for medical and psychological treatment, therapy, and counseling. They have also suffered economic business loss as a result. I don't know about you, but I think that's pretty darn serious, particularly since it's repeated over and over and over in the Complaint. I honestly worry about the physical and mental well-being of our mayor and mayor pro tem and wonder, considering the apparent extent of their "injuries" in this case, how they can be expected to fulfill the duties of the jobs to which they were elected. I mean, these disabilities seem very severe, which will certainly be borne out when all their medical records and financial records are subpoenaed and when they are deposed for the trial. Perhaps, in the interest of their health and financial well-being, we should ask them to step down and permit those chairs on the dais to be filled with people more temperamentally suited and physically and emotionally more stable. 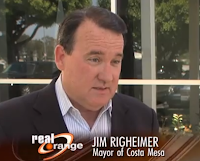 Both Righeimer and Mensinger have frequently complained about the pay for the hours they devote to city business. It would seem appropriate, especially under the circumstances, that they step aside so they can devote more time to providing a good life for their families and to get their mental faculties back in order. Of course, reading that complaint, it seems they doubt they will EVER be able to accomplish that. WHERE'S GARY ON THIS ISSUE? And, as I read those complaints, I wonder about Gary Monahan. After all, if we believe the story Lanzillo is apparently telling folks, he was in Monahan's gin mill with an attractive associate to entrap him into some kind of an illicit affair. You'd think that if ANYONE should be feeling persecuted and be stressed out about this event it would be Monahan. And yet, he is not a party to the lawsuit. Doesn't that seem just a little peculiar? And, as I read those complaints, I couldn't help think of the employees of the city who have suffered in the toxic workplace created by those two men for more than two years. It seems to me that EVERY ONE of the phrases used apply precisely to most, if not all, the current and past employees who have had to deal with the capricious, thoughtless, heavy-handed methods those men have tried to use. I wonder whether any of them - or all of them - have read this complaint and considered filing a similar action against Righeimer and Mensinger? Seems like something to consider, doesn't it? Putting self-interest ahead of the best interests of the institution or organization they run. Being certain. If you think you know everything, why bother to listen? Failure to live up to their own values. Being so enamored with their vision that they lose all capacity for self-doubt and lack the ability to look at the consequences of their actions. Personal arrogance and hubris. It's demotivating for most in the organization and increases the chances of making big mistakes. Acting too fast. Step back and consult, then act. When it's all about the leader, not in service of something bigger. Not being authentic, consistent and predictable. Not being self-reflective. Failing to hold up a mirror to themselves and consider their impact on other people. The worst leaders just bulldoze, plow through life, not learning through their mistakes. I watched that tape and, as I suspect many of you will, had this feeling of deja vu - like I've heard this all before. I've known some outstanding leaders in my lifetime - including some in this city - and was fortunate enough to work for a few of them. The majority on the City Council - the people elected to lead this city - share none of the characteristics of those men and women I recognize as outstanding leaders. Perhaps Jim Righeimer and Steve Mensinger will step down to preserve their own mental and physical well-being - and to permit them to earn a living - and allow us to place true leaders in their chairs on the dais. This city needs those kind of people in leadership roles - right now!